Werner's Cairns blog: An excerpt from a migrant’s diary. An excerpt from a migrant’s diary. When I arrived in Australia with my wife Karola and 14 month old daughter, Sonja, a steep learning curve was in front of us. After we arrived in Melbourne by ship (Skaubryn) we were put on a train to Albury NSW and then sent by bus to the Bonegilla migrant camp just a few kilometres across the border in Victoria. We were there for a week and I was eager after 6 Weeks at sea to get to work and earn money. I volunteered to cut sugar cane, although I had other qualifications. I was a graduate of an agriculture college specialising in horticulture, centering in the main on viticulture and fruit growing, and I was also a cabinetmaker. I grew up on our family farm in Bischoffingen on the beautiful Kaiserstuhl in the far southwest corner of Germany. Our intention was to stay for two years only and then go back to Germany, but after a short time we decided to stay here for good; applied for citizenship and became proud Australian citizens in 1959 in Mossman North Queensland. So, there was an awful lot to learn for me and Karola. It was not only a change of scenery, but we also came to a different culture. It was here where I for the first time heard the word "Prawns" - I ate some and got terribly sick. But we were quick and eager learners, we adapted and integrated into Australia’s life and culture. I hope that you find this excerpt from our life in Australia interesting. In the 1950s there was a shortage of cane cutters in NSW and Queensland. A meeting was convened to inform most of the men that came with our ship, what cane cutting was about. The immigration officials tried to persuade the men to go north and cut cane. The only exemption was people with special trade qualifications or people that wore glasses. So, I went to the meeting to see what it was all about, and I put on my reading glasses for "protection". We were told that it was hard and dirty work, but that good money was to be made cutting cane, and that aspect appealed to me. Prior to this meeting; rumours went around the camp such as, "They have to burn the cane to remove the dry leaves for the harvest," which was true. What wasn’t true, but everybody believed it, was that the cane cutters have to first kill badly burned carpet snakes that live in the sugar cane for their food and they have to kill them to put them out of their misery. Needless to say; there were no volunteers to be found. And since I grew up on our family farm and was used to hard and sometimes dirty work, I went to the immigration officials and said, "I want to go and cut sugar cane." The officials looked at me and said, “You don’t have to go as you are wearing glasses." I took them off and said, "I only wear them for reading." So they put me on to their list. I’m sure that I was the only volunteer - the others were “volunteered” under the pretext that there was no other work available for them at the moment. Within two days we were on a train in Albury with the prospective cane cutters including their wives and children. The prospective cane cutters were taken as far as Cairns and were "unloaded" in towns where cane cutters were needed and the required number of men were picked up by farmer organisations and brought to farmers that needed them. The first train stop after Albury was at Newcastle NSW and all the wives and children were told to get out, and were then taken by bus to the Maitland immigration centre. The immigration officials couldn’t tell me when I would see Karola or Sonja again, and this was a difficult "departure" for us. The next stop was Grafton NSW and the names of sixteen people were called that had to go out; I was one of them. We were split into groups and allocated to cane farmers in the MacLean district north of Grafton, whose farmers supplied the cane to the Sugar Mill at Harwood Island. In our group of five men, four came from big cities and were office workers, and I started to wonder how they would perform carrying out this hard and dirty work. I was made the ganger (foreman) of the group, so I was the liaison between the farmer and the group, and responsible for organising things like our food. I had to write out a list for the butcher, the baker and the grocer then give it to the farmer who took the list to them. Since all of us had only twenty pounds that was given to us by the government, the farmer paid for all the food and then deducted what we owed him from our wages on payday. As the ganger I earned one extra pound. Unfortunately, as I suspected in light of the poor performance of the four men, and with the small amount of cane we were cutting, I could foresee that we wouldn’t get much money after the farmer took out of our pay what we owed him. And this is exactly what happened. So, on the weekend I went to Turkey Island where another German gang was. I first asked them how much they earned, and learnt that it was four times more than we did. So then I asked them if I could join them, and they said, "Yes please." Turkey Island is in the Clarence River Delta. (As a matter of fact, there are 99 Islands of all sizes in this delta). Turkey Island is very small and the Macleod family was growing cane there, and like most other cane farmers they also had cattle and their milk brought extra income. 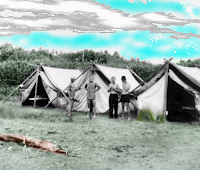 The cane cutter housing consisted of three tents with rough single camp beds. The bedside table was an empty 20 litre oil drum and light on top of it was a kerosene lamp. The kitchen was a freestanding structure and consisted of two posts with a roof over it and with a wood stove under it. The kitchen utensils were hanging on nails in a board above the stove. It was certainly nothing to brag about. This is a very old black and white picture, but I put some colour in it. The man with the cane knife on the left side is me. One of us had to be the camp cook, preparing breakfast, lunch and dinner. The drawback of this was, while he did this he didn’t cut cane, yet the remuneration was per ton cut and the pay for this was shared by all four of us. After about two weeks, immigration officials came and told us that our wives and children will come and were to be housed in the seaside resort of Iluka NSW. That was music to our collective ears. We stayed there on the weekend and were taken there by a truck sitting in its tray and then ferried again back to Harwood Island from where we made our way on foot to Turkey Island. To get there we had to walk through some headlands of other farms. And, to get to Turkey Island we had to use the rowing boat that was always attached to a post on the opposite side of the river. Also parked on the other side of the river was the farmer's T model Ford. I said to the others, what about if we ask our four wives if they would be our camp cook. To have one of them for our camp cook would mean all four of us could cut cane and we make more money? They thought this was a good idea, and since the cane cutting season had only four weeks to go it would mean that each wife would only have to do the cooking for only five days. So, when I came to Iluka on Friday afternoon I had an emotional reunion with Karola and Sonja. Later on, I arranged a meeting with the other blokes and their wives to come to our unit and over a cup of coffee; try to hammer out whose wife would be the first one to be camp cook. When the question was put, there was a long silence and nobody put a hand up. To get over the apparent impasse, Karola said, "I go first." So, on Monday morning the truck came to pick us up, and Karola and Sonja were given the "luxury" of sitting in front beside the driver. So when we arrived at Turkey Island it was a tremendous shock for Karola to see that the sleeping quarters were three tents, yet seeing the kitchen, if you could call it that, gave her the biggest shock, despite my telling her a little bit about it at Iluka. Karola, Sonja and I slept in the middle tent. In the tent on our left were two of our crew sleeping. At midnight a hell of a racket of swearing and screaming awoke us. Wild pigs had run through the tent and under the two beds and tossed the sleeping men out of it. I said to Karola that it was really nice of the pigs not to select our tent. When we went back to Iluka, the three men couldn’t tell their respective wives’ quick enough about the "Fly-by-pigs" at midnight on Turkey Island. This resulted in the other wives refusing to be our camp cook, and typical of Karola, she said, “Well, I do it till the end of the season”- yet Karola was 6 months pregnant. On Turkey Island we had my/our introduction to prawns. Mrs. Macleod brought us a big dish full of them, which her husband had caught in the river. One of our crew who spoke fluent English explained the cooking instructions given by Mrs. Macleod to Karola. None of us had ever heard of or seen prawns. These prawns were the small ones, and were cleaned and ready to cook. To us they looked like the larvae of witchetty grubs, and not especially appealing. However Karola cooked them according to instructions. At first I took tentatively small bites, but found the prawn very nice and started to eat them with abandon like everybody else. However, I got terribly sick after a short time with vomiting, but luckily nobody else did. Karola said to me, "You look green," and I replied, "That is exactly how I feel." I was so sick from a bad prawn that I couldn’t cut cane for a day. From this time on I couldn’t stand the sight of a prawn. Whenever I saw them inadvertently in a shop, I got goosebumps all over me and had to walk away or look to the other side. Now I’m jumping 20 years ahead, to when I was managing Dr. Lesley Westaway’s 95 hectare cane farm located on the Captain Cook Highway at Smithfield, which also went down for two Kilometres on one side along Yorkeys Knob Road. At the end of the harvest season it was customary to have a feast with delicious finger food and drinks, and everybody who worked in some capacity on the farm during the season was invited. Margaret, Lesley’s wife, arranged all that. Amongst all the goodies I spotted a big dish with small battered fish. I ignored most of the other food and made just about a guts of myself with this lovely battered fish. At the end of this feasting Margaret said to me, "Werner, take as much as you want to Karola and the kids." So I loaded a big plate with a variety of these goodies, but the biggest portion was the delicious fish I had eaten all afternoon. When I came home I said to Karola, pointing to these lovely battered fish, "Those were the best fish that I have ever eaten." Karola took one look and said, "Those lovely fish are prawns!" That was a bit of a shock and I lost my faculty of speech for a few seconds. Then I said to Karola, "Are you sure?" "Yes, I’m 110 % sure. I worked long enough in Cairns Hotels as a cook and I know what prawns look like." Well, the moral of this was a clear case of mind over matter. My utter dislike for prawns, and the goosebumps had suddenly disappeared, and a profound liking of prawns has replaced them. Now back to Harwood Island, another culture shock was in store for me. As I wrote before, we had to walk through several headlands of other farms to get to Turkey Island. In Germany it was drummed into us kids that when leaving a room to close the door. In winter it kept the cold out and in summer the heat. So when we came to an open gate of a cow paddock, my mind was still sort of in Germany and I closed the gate, thinking that I had done the right thing. So, when we had our "Smoko" time in the morning (Smoko is an Australian vernacular for a 15 minute work break) we saw a farmer from the other side getting into the rowing boat and we thought he was coming to see Mr. Macleod, but he wasn’t. He came straight over to us, asking, "Who of you shut the bloody paddock gate?" I said, "I did". He responded with, "Why the bloody hell did you do it?" "Well we always closed doors in Germany". "You are not in bloody Germany now!” He advised me: “If you go through a gate or door that is open, leave it open, and if it was closed, close it again." What I of course didn’t know when closing the gate was that the farmer was at the other end of the paddock, and wanted to herd his cattle into his milking shed through this gate. So there was a big herd of cows at the closed gate. I learnt a valuable lesson in my new country. What an interesting read, Werner. No doubt, your wife was a wonderful lady to endure hardship and being so altruistic and volunteering to cook for the gang. People like Karola are hard to find these days. A very interesting story, Werner! Migrants had to pull their weight then, and were not pampered and depending on welfare. I totally agree with the comment from Betty C. It must have been a hard beginning for you two, but with such a wonderful selfless wife on your side, your journey in a new land would have been much easier. I absolutely enjoyed your fascinating story, and you told it so well. And, what Karola did was more than admirable. We totally agree with all the previous comments, they are our sentiments as well. However, what Karola did for the benefit of others was beyond her call of duty. Thank you, Werner for sharing this story. Yes, as expressed in all the comments above, Mum was a very special person. I've always admired her quiet courage and strength. Mum had three children in just under three years, and endured many hardships in her first years in a foreign country with a foreign language, having left behind her family and friends. Yet she never complained, and she always put others before herself. She showed the same courage and selflessness her entire life. Thank you, Werner, for another interesting story from your life. This would be very interesting for the future generation of your family to read, how you and your wife started in Australia. I also must say that Karola was an admirable lady. You have an amazing memory Opa. It is such a privilege to have such detailed accounts of your (our) history. It is really hard to believe the hardships you put up with as an early migrant. Werner, I just read your story and I like all the comments. I think your memory is amazing, and I do hope you have put all of this down in a book as in a generation or two they will need all this.. and give one to the museum ..
Today far to many of these immigrants come in and just live off welfare..
What a wonderful story Werner. I just can't imagine the hardships that you had to put up with. Many young people today wouldn't. Yes, Karola was a very special lady and I still miss her. Turmeric, not just a humble spice.